At an insane asylum, Baxter Stockman retells his tale to his cellmate; “Napoleon”. 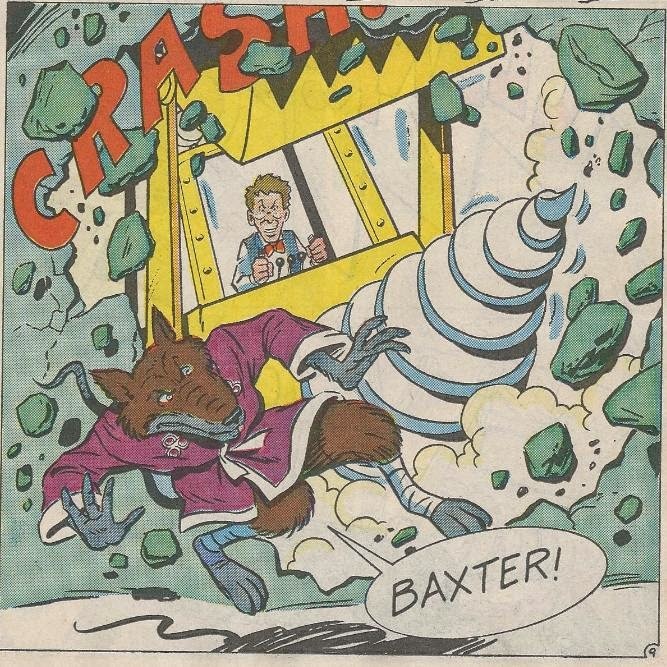 Shredder suddenly breaks him out and a grateful Baxter offers to help him by turning a piece of construction machinery into “the ultimate rat-catching device”. At Channel 6, Burne is overjoyed at the footage of the Crooked Ninja Turtle Gang in action, though April still insists that they’re imposters. She contacts the TMNT over her Turtle Communicator and invites them over to the Channel 6 building to show them the tape. The Turtles view the tape and deduce that Shredder is behind things. Then are then frightened off by a shrieking Tiffany, who just hates Turtles to death. Down in the sewers, as Splinter meditates, he is caught off-guard by Stockman and his new rat-catcher. Stockman captures Splinter and whisks him away. The Turtles arrive and follow the trail back to an ambush by Smash and the Crooked Ninja Turtle Gang. They whimsically defeat the impersonators and then force Smash to tell them Shredder’s whereabouts (the Slash 4 Cash Dojo). Back in the sewer, April stumbles upon the trail and follows it. 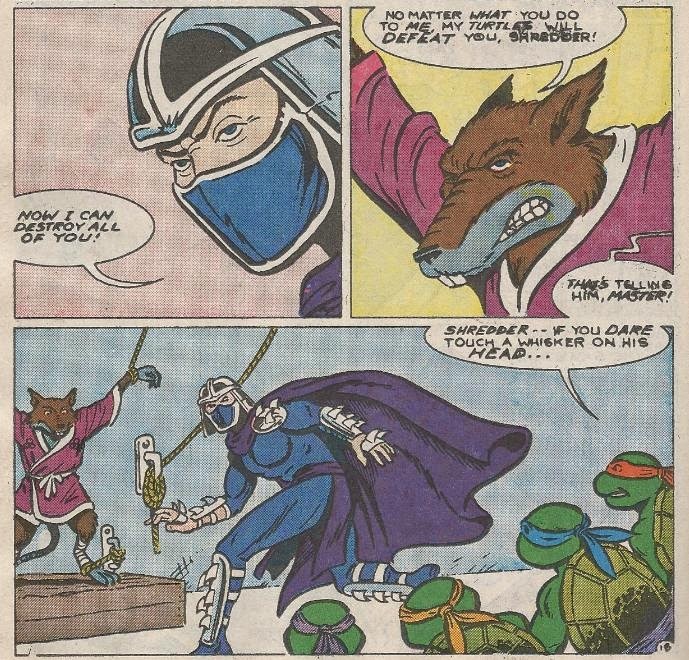 At the Dojo, Shredder has Splinter at his mercy and intends to crush him with a giant wooden fist. The Turtles arrive too late, but before Shredder can drop the hammer on his nemesis, an overly enthusiastic Stockman jumps the gun and crashes through the wall in his rat-catcher. The Turtles beat up the rat-catcher and force Stockman out, then commandeer it and use it to intercept the giant careening fist. As Leo frees Splinter, Shredder and Stockman escape the scene of the crime. The police and Channel 6 arrive, apprehending Smash and his gang and clearing the TMNT’s good name. 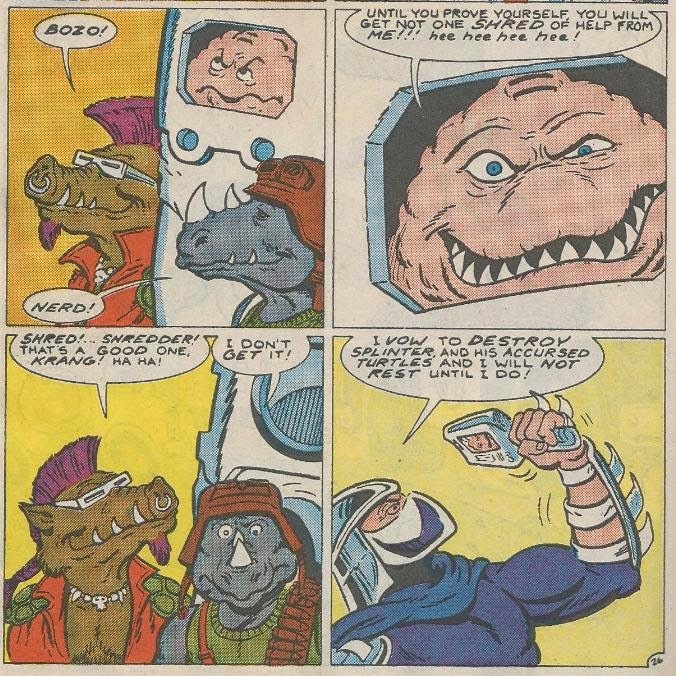 Meanwhile, Shredder is berated by Krang for failing. Back at Channel 6, Irma brings Burne his order of mock turtle soup. Tiffany takes that as a sign that Burne is a turtle-lover and dumps him. Down in the sewer, the Turtles watch April’s report on TV and as it ends with a wink, they argue over who it was directed at. Before they can mangle each other, April announces she was winking at Splinter. 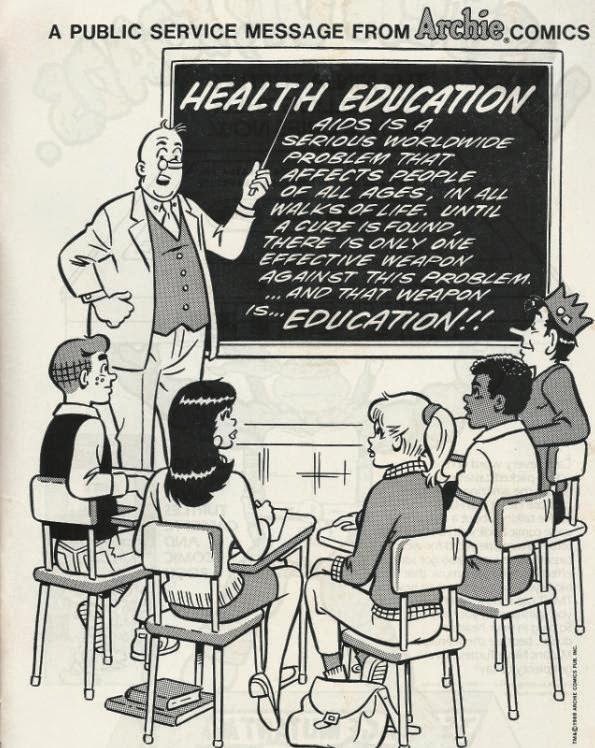 We’re then treated to a public service announcement from Archie Comics in which the Riverdale gang learn the dangers of AIDS. What a downer. 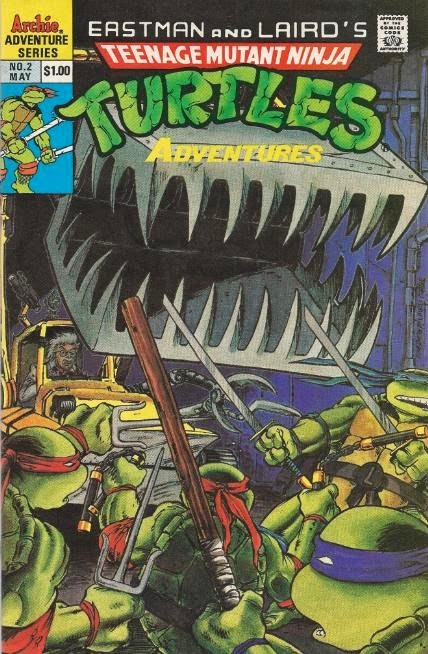 *This story is continued from TMNT Adventures #1. This story is continued in TMNT Adventures #3. *This story is adapted from the episode “Return of the Shredder” from the Fred Wolf TMNT cartoon. *Smash is mistakenly referred to as “Slash” in this issue. *This issue was reprinted in the UK by Fleetway in TMHT Adventures #5. We’re getting pretty close to the end of these episode adaptations. Just hang in there, man! Just hang in there! 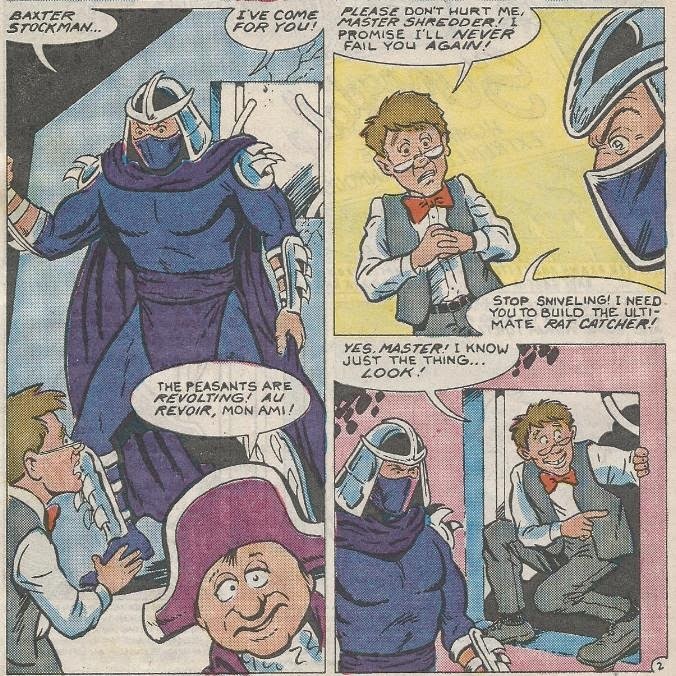 The “Return of the Shredder” story was fairly fun in the cartoon, thanks mostly to Peter “Optimus Prime” Cullen voicing Smash, but when spread over two issues of a comic it falls exceptionally flat. This second half stands up a bit better than the preceding one, since it actually features a fair amount of the Turtles and scarcely any of the Channel 6 crew. Still, this book isn’t going to get good until they start up with original content. On a final note, this cover by Eastman and Laird is noteworthy because, while the previous issues had the characters in generic poses not entirely related to the content of the issue on the cover, this one features Eastman and Laird drawing a scene directly out of the cartoon. As such, it marks the only time I’ve ever seen them draw Baxter Stockman in his cartoon model (as you may or may not know; Stockman was black in the Mirage comics). Just figured I’d bring it up. April's *wink* face is almost as creepy as the thought of her and Splinter flirting with each other. I'm amazed at everyone's lack of basic observation skills. The Crooked Ninja Turtle Gang clearly are all wearing the same color and have human faces FFS!